If you need Boynton and Delray Beach Electrical Panel Replacement, call Suncoast Electric & Air. We are a family owned and operated business that is available 24/7 and guarantees all of our work. 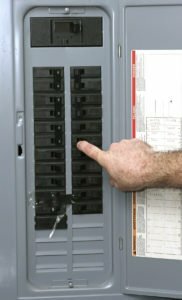 If you are having trouble with your electric panels, we will get a licensed and skilled technician out to you right away. All of our technicians receive comprehensive training to ensure they are thoroughly competent in handling Delray Beach Electrical Panel Replacement. Although any electric panel can fail, some are more prone to needing replacement. Some types of panels can even be dangerous to you and your family. Zinsco: Although Zinsco panels were once popular, they were later found to be very dangerous. After a few years, they often fail and put you and your family at risk of electrocution or fire. If you have a Zinsco panel, you should consider Delray Beach Electrical Panel Replacement. Federal Pacific Electric (FPE): FPE panels were the most popular panels from the 1950s through the 1980s. It has since been recognized that they are not safe. Although they can work fine for many years, one electric issue can lead to a house fire. Challenger: These panels were common in the 1980s and 90s, but today are a known fire risk. They are prone to overheat, sometimes even under normal conditions. If you have any concerns about your electric panel, call Suncoast to find out if you need Delray Beach Electrical Panel Replacement. Today many manufactures provide safer and more efficient alternatives. We recommend that you get Delray Beach Electrical Panel Replacement every 15 years. An updated panel will prevent against fire, electric shocks, burns, and power failures. Our licensed, trained and professional staff can help you pick out the panel that is right for you. If you need Delray Beach Electrical Panel Replacement, call Suncoast at 561-220-0183. Our family has been in the business for three generations, passing down valuable skills and knowledge. Suncoast prides ourselves on customer satisfaction and will never leave a job until you are happy. Give us a call so our family can make sure your family is kept safe.